McCordsville, Indiana is located in Hancock County, about 20 minutes from Indianapolis. The area was first settled by William McCord in 1833, and in 1865 35 lots were laid out for the town. This small town was incorporated in 1988 and has an estimated population of 7,000. Just off State Highway 67, it is about 10 minutes from I-70. Although the town is not rich in historical buildings, it has a variety of eating establishments of many different kinds, from fast food to fine dining. A night out in this small suburb can easily include a great meal. The area is filled with beautiful foliage and large yards, and one neighborhood features the Open Door Equine. They will train your horse, give riding lessons, and even offer seminars in drawing horses. Horse lovers won’t be disappointed. The Scarlet Lane Brewing Company opened in 2014 and has Oregon inspired brews. The McCordsville Sports Park is located on the restored Dillinger Dog track, which was constructed in the 1930s. This Park is being constructed in phases, and the 88-acre Woodbury Ridge is a mixed-use area that provides a place for athletes to not only play but to train. Currently, the area is seeing a lot of soccer use. Because McCordsville’s location is so close to Indianapolis and other historic communities, there is an abundance of entertainment, as well as recreational opportunities available without having to endure a long drive. The real estate in this little town has a nice mix of older ranch style and bungalow homes as well as large, newer homes in new neighborhoods. With a low crime rate and a great school system, this has been reported to be a great place to not only start a family but a good place to retire. With a relaxed small-town feel, but the amenities of a growing town, it has much to offer. 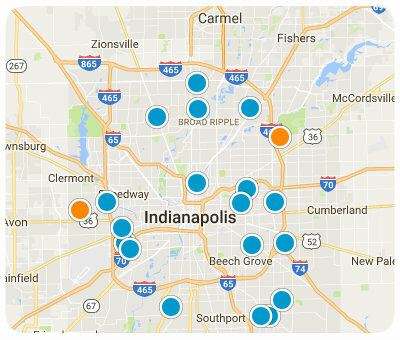 With the proximity to Indianapolis, you have all the attractions of the big city, from shopping to sports events. When you take these things into consideration, you’ll see that this is a must-consider destination for home buyers searching in the Indianapolis area. If you would like more information on McCordsville, Indiana, please contact us today and allow us to assist you. Listing courtesy of Top Notch Real Estate Group. Listing courtesy of David Nash.